Change is ahead in the underwater environment as this year’s Underwater Defence Technology (UDT) event in Bremen, Germany, highlighted. With many nations looking to the next generation of submarines, mine countermeasure vessels and anti-submarine warfare we are likely to see many new platforms being inaugurated to the underwater domain in the next decade. During the days of the conference it was noted by RAdm Thorsten Kahler, chief of staff of the German Navy, that for many years the underwater threat did not receive the number one priority in the service. 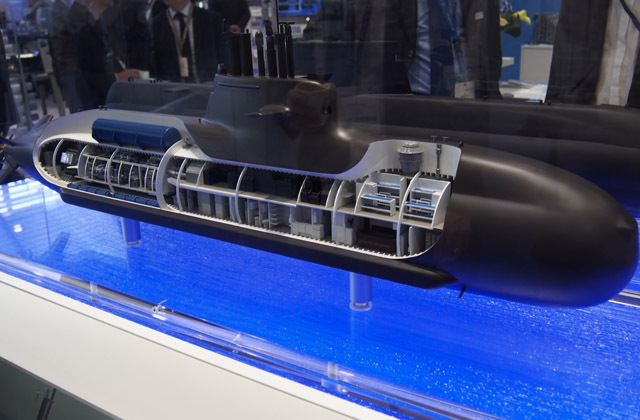 The Germany Navy, along with its partners Italy and Norway, is now looking at future submarines as well as other technology. You can read about the developments here. Meanwhile, there was a key focus on unmanned systems and how best to integrate them into the underwater territory. Leading the way is the use of such systems for mine countermeasures but various other applications are now being explored. Cpt Herman de Groot of the Royal Netherlands Navy noted that ‘AUVs will change the underwater battlespace forever’ and UAVs will also soon become a part of the underwater environment. Saab, Atlas Elektronik and L-3 Clazoni were among exhibitors showcasing their unmanned technologies. While industry has been showcasing and proving its unmanned capabilities for some time now it is up to military to fully embrace the technologies and put it to the best use against adversaries who are undoubtedly looking into similar unmanned platforms. The use of unmanned technology will of course throw up various legal dilemmas for the maritime industry. While vessels and submarines were a key focus at UDT there was a significant nod to the underwater special forces community with various companies displaying specialised diver equipment. One of the talking points though came from two companies showing off various diver delivery systems. Rotinor with its Black Shadow 730 and JFD with its Torpedo Seal, two very different designs for a similar application. Next year UDT is set to be held in Glasgow, Scotland, so expect a big presence from the UK Royal Navy and we hope to see you there.